On this page we will look at the resourceful Meerkats. 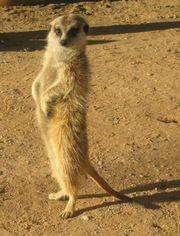 Why do meerkats like to stand on their hind legs? Meerkats stand up so they can see their enemies better. At only 12 inches tall, these inhabitants of South African deserts and plains look like a nice snack to predators such as jackals and the martial eagle. But because meerkats are very intelligent and social, they are not easy prey. They live in mobs of up to 30 members, and each of them takes turns with chores such as hunting, digging, and keeping a look out for danger. There are always one or two sentries on duty for each mob, and they stand as tall as possible to better detect danger. The sentries sound a unique alarm depending on which predator they see. Meerkats forage in a group with one "sentry" on guard watching for predators while the others search for food. Sentry duty is usually approximately an hour long. The meerkat standing guard makes peeping sounds when all is well. If the meerkat spots danger, it barks loudly or whistles. Meerkats are primarily insectivores, but also eat lizards, snakes, scorpions, spiders, plants, eggs, small mammals, millipedes, centipedes and, more rarely, small birds. They are partially immune to certain venoms; they are immune to the very strong venom of the scorpions of the Kalahari, unlike humans. They have no excess body fat stores, so foraging for food is a daily need. This video shows the lives of a mob of meerkats in the Kalahari desert. Images of the wily little mammal of the Kalahari Desert known as the meerkat.